The winners of the 2019 TEAM Westport Teen Diversity Essay Contest post with TEAM Westport Chair Harold Bailey (far-left), Westport First Selectman Jim Marpe (second from right) and Jocelyn Barandiaran, Sr. Vice President of the Westport Library Board (far-right) at the contest's awards ceremony at th Saugatuck Congregational Church on April 3. From left to right the winners were Chet Ellis, first place, Angela Ji, second place, Daniel Boccardo, third place, and Olivia Sarno, honerable mention. 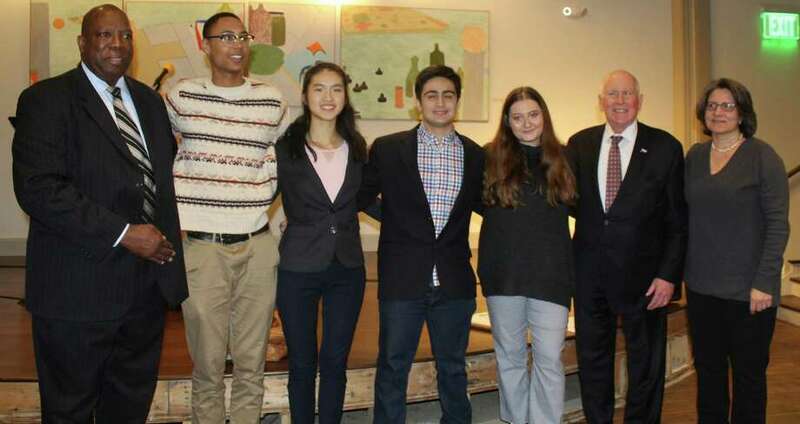 The winners of the 2019 TEAM Westport Teen Diversity Essay Contest post with TEAM Westport Chair Harold Bailey (far-left), Westport First Selectman Jim Marpe (second from right) and Jocelyn Barandiaran, Sr.
For years, Westport has been a national suburban leader on social issues. We bought Cockenoe Island to prevent it from becoming a nuclear power plant. Our Representative Town Meeting voiced its opposition to the Vietnam War. Years later, we were the first town east of the Mississippi River to ban plastic bags. And Westport was one of the first suburban towns to open a homeless shelter, three decades ago. It’s still going strong. I don’t think too many suburbs have a townwide diversity commission either. TEAM Westport — the acronym stands for Together Effectively Achieving Multiculturalism — was founded by First Selectman Diane Goss Farrell. Her successors Gordon Joseloff and Jim Marpe have continued their steadfast support. Low-key but effectively — hey, that’s in their name, right? — the organization has shined a light on the positive aspects of Westport’s diversity. It has also shown us how far we still have to go. TEAM Westport has supported programming around Westport Country Playhouse and Westport Library initiatives, bringing in speakers and sponsoring events that amplify, or otherwise add to, a current play or the WestportREADS program. They’ve organized panel discussions and teach-ins about current events — Barack Obama’s presidential campaign, for example, or attacks against Muslims. They’ve worked on Holocaust events with schools, and exhibits with the Westport Historical Society. TEAM Westport has invited police department leaders to meetings, to better understand the dynamics of police work. At the same time, TEAM representatives have conveyed concerns from minority community members about the police to those leaders. TEAM Westport does a lot. Its volunteers represent all kinds of diversity: racial, religious, ethnic, gender and sexual orientation. So it’s no surprise that the three winners (and one honorable mention) in this year’s Teen Essay Contest represent a broad array of Westport diversity too. The annual contest encourages high school students — those at Staples or Greens Farms Academy, and anyone living in Westport but attending school elsewhere — to think about important issues. Past topics have included white privilege, Colin Kapernick’s “take a knee” controversy, and Black Lives Matter. This year’s prompt was on microaggressions. Students were asked not just to describe microaggressions they’ve felt or seen, but to consider steps that organizations, schools or individuals could take to greatly reduce or eliminate them. This year’s first place ($1,000) winner is no stranger to microaggressions or to TEAM Westport’s essay contest. Two years ago, then-sophomore Chet Ellis won also. He described being one of three African Americans in his U.S. History class (where a white student used the “n” word). Chet is now a Harvard University-bound senior. He’s a top student (and one of the best high jumpers ever at Staples). But his path has not been easy. At Staples, a freshman soccer teammate photoshopped Klan hoods on all the players around Chet. He was devastated, but again said nothing. Soon, however, he realized that by not saying anything over the years, he allowed microaggressions to continue. Second-place ($750) winner Angela Ji is a Chinese-American. She was subjected to microaggressions like classmates pulling the corners of their eyes, and a stranger who does not understand that she is from Westport, not Asia. Daniel Boccardo won third place (and $500) for “Cactus in a Rainforest.” The Staples senior has spent his life dealing with microaggressions based on others’ assumptions that because his parents are Venezuelan, he and his family fit certain stereotypes. Olivia Sarno captured honorable mention. Part of the LGBT community, she wrote about the microaggressions that come from feeling invisible. Two decades after its creation, some Westporters still wonder if we really need TEAM Westport. This month, four teenagers showed us exactly why.